Please call owner Craig at 267-918-4500 or 267-918-0947 or 609-399-6569. Boat is in Ocean City, New Jersey. 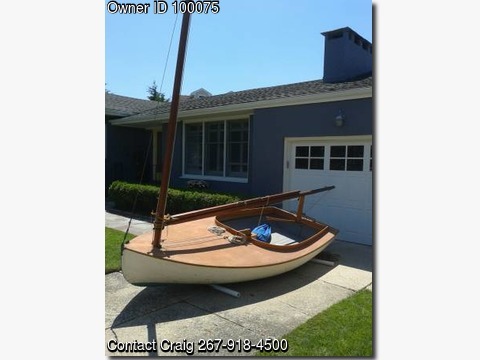 Beautiful classic wood Cape Cod Catboat. A work of art on the water. This boat is in good condition, but for anything you need to maintain her, these are still made. She only needs a coat of paint. Classic Cape Cod Cat Boat. 12', wood, built 1975. Beautiful workmanship & a boat with a story behind it. Good condition, needs new paint.Price negotiable. Here is some info from Beetle Cat website. The Original Beetle Cat Boat was designed and built in 1921 and immediately began to appear along the shores of New England. Over 4000 of these boats have been built to date. The design of the Original Beetle Cat was taken from the old 20-30 foot catboats that were used for fishing in shallow waters along Cape Cod. In the years since the first boat was built, the design has remained essentially unchanged. The Original Beetle Cat Boat is 12ft-4in long and is a design adaptation of the great Cape Cod Cats. The wide beam, with the rudder not extending below the bottom of the keel, and centerboard that lifts up, are features that lend this boat to shallow waters. It is a boat that can be beached. The wide beam (6ft) makes it unusually stable and gives it a large carrying capacity. Made entirely of wood (oak frames with cedar planking), with no ballast, it is unsinkable. The large decked area forward on the boat means spray falls on the deck rather than inside the boat. The rig is similar to that used on the old, large-size Cape Cod catboats, with the mast well forward, and using a single sail. With this type of rig (gaff rig), if you release the tiller, the boat will head into the wind and practically stop. This feature makes it an ideal boat for youngsters.Boat Specifications: Length Overall - 12' 4" Length Waterline - 11' 8" Beam - 6' 0" Draft with Board Down - 2' 0" Draft with Board Up - 0' 8" Sail Area - approx. 100 sq. ft. Weight - approx. 450 lbs.